The car alarm buzzing for no reason is a common issue reported by many people. The problem gets even more frustrating at night when people are sleeping, and suddenly your car alarm goes off without any apparent reason. Why does this happen? It is not necessary that your car is being robbed, sometimes faulty installation or other reasons also cause the alarm to go off, and in this article, we will discuss some of the common causes to help you figure out and fix the issue. There are a lot of different possible causes of a car alarm which keeps going off. Remember that you first have to consider which type of car alarm you have. There is a big difference with a car alarm on older cars which is installed out of the factory and a newly integrated alarm in newer cars. If you have a newer car, the best way to locate car alarm issues is by checking the trouble codes in the car alarm control unit with an OBD2 Scanner. Cheaper OBD2 scanners do often not have the ability to read other trouble codes than from the engine control unit. Get a more advanced one or let a workshop check the codes for you. Here is a list of the best OBD2 scanners to buy. 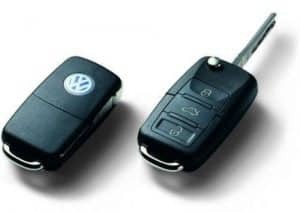 The key fob is also known as car remote key is a device which is used to lock/unlock your car doors and even start the engine with just a push of a button. Since the key fob also has controls linked with the car alarm system, a malfunctioning or faulty key fob can send an incorrect signal which may trigger the car’s alarm. You can check and replace the essential key fob batteries or reset the device to fix the problem. When you have replaced the batteries and you got communication problems, you may have to reprogram your key fobs in some situations. Besides alerting you about thieves breaking into your car, the car alarm also warns about low battery level. If your battery is about to die and you switch on the engine, the alarm will go off indicating low battery level. Check the car battery with a multimeter, if the reading shows less than 12.6 volts, it means that you need a battery. A sensitive shock sensor tends to trigger the alarm even if a dog or a cat slightly touches your car. If the alarm keeps beeping now and then, it will drain the battery sooner than you think. The shock sensor can be easily configured by twisting it. If you are not sure how to do it, refer to the owner’s manual. Modern vehicles are equipped with a hood latch sensor which triggers the alarm if someone is trying to force open the hood of your car. 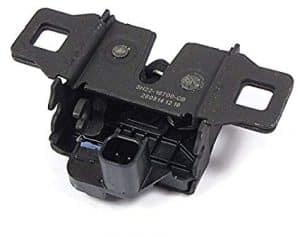 Depending on your car’s condition, it is very likely that dust, grime, and debris get collected where the hood latch sensor is located and this causes the alarm to go off. To fix this problem, locate the sensor and have it cleaned. Even after cleaning the latch sensor, you can hear the alarm sound; it is possible that someone tried to tamper with the sensor or the sensor is not installed correctly. You can find the hood latch sensor located near the headlights. Cleaning the latch sensor is relatively simple. You will require a brake cleaner, cleaning brush and a microfiber towel. Start with locating the sensor and make sure you have removed the negative terminal of the battery first. Once the sensor is located, unplug it and notice any signs of damage or dirt. Spray the brake cleaner on the sensor and make sure all the dust and contamination is removed. Using the brush, gently remove any residual parts and finally using the microfiber towel, wipe the sensor to make sure it is perfectly clean. Re-install the sensor and connect the negative terminal of the battery to recheck the result. Rusty battery terminals cause the battery to supply power unevenly throughout different electrical components in the car. In such a case, the alarm sensor will think that the battery level is low and set off the alarm. You can clean the rusty battery terminals using a battery cleaner. However, don’t forget to remove the electrical connections first and wear protective gloves. If you have recently installed a new car alarm system and you noticed that the alarm keeps going off for no reason, it may be because of incorrect installation. If you have a digital multimeter, you can check whether each wire is receiving enough power and diagnose the problem quickly. Can you Deactivate the Car Alarm? If you can remove the car alarm by deactivating it, depends a lot of the type of car alarm in your car. Modern cars with an integrated car alarm are almost impossible to disable without a software manipulation, while older cars with an aftermarket alarm installed, can often just be removed. Your car alarm can annoy the neighbors or residents nearby which is why it is necessary to know how to disconnect it in case it keeps going off. Here are the standard methods you can follow to disable the car’s alarm. On some older car alarms, you can locate and remove the fuse to get rid of the car alarm system. This required some knowledge of finding the right fuse. This method is not applicable for newer cars, because you won’t see a separate fuse for the car alarm system, as it’s integrated with the Central Electronic Module. 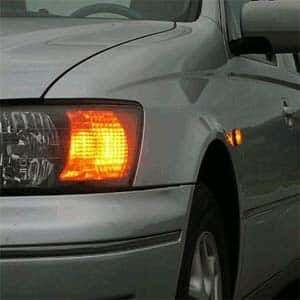 This methods are often possible in older Asian cars like Honda accord, civic and Toyota Corolla. In some newer cars, you will have the ability to remove the function with a code scanner. This required a good code scanner which has some programming functions. Contact your local mechanic workshop if you are not very familiar with car programming. On Audi A6, A4 and other Audi models, you can reduce the sensitiveness of the car alarm with a code scanner, to reduce the chance of getting a false alarm. If your car alarm is the aftermarket type, installed after the car factory, you can often delete the car alarm with wirings. This does require some electrical skills though, and you have to find some information about the car alarm type. Locate the installations and do the install instructions backward. A car alarm going off continuously can be very disturbing and should be fixed right away, as it may drain your car battery and disturb your neighbors. With the key points we discussed above, you can easily diagnose what is causing the alarm to set off and fix the situation yourself instead of going to a mechanic. However, if the alarm system is still not fixed, you should consider buying a new system if possible. A Basic car alarm system can cost between $30 and $300 while the advanced ones with immobilizer and additional sensors can cost up to $800 and are not possible to install in the aftermarket. The installation cost will typically be between $50 and $200 on older cars, but you should always visit a professional mechanic who would do a good job. If you have any questions, leave a comment down below.